If you are like many chronic back pain sufferers you probably have tried pain medications, muscle relaxers, anti-inflammatory drugs, steroid injections, physical therapy, and/or even surgery, with little or no improvement. Even if you are considering spinal surgery, you probably understand that the results from that type of major operation are not guaranteed. Thankfully, there may be relief in sight for those of you who are suffering with spinal disc injuries and degeneration, and the treatment is called Decompression Therapy, a traction-based procedure. Unfortunately, low back pain is an often mistreated disorder that affects the lives of millions of Americans each year. Decompression Therapy is an FDA cleared technology that may relieve pain by restoring health to the spinal discs located between spinal vertebrae. Traction is one of the oldest treatments used in physical medicine. Decompression Therapy is a modern application of traction. Applying intermittent traction forces to the spine can aid in the healing of vertebral discs. The objective of traction is to reduce the pressure inside the disc and facilitate the transfer of fluids, nutrients and oxygen back inside the disc. Treatment programs at our office focus on getting to the cause of chronic neck or back pain. This may include traction, chiropractic adjustments, ATM2 treatments, soft tissue mobilization, and prescribed stretches and exercises to stabilize the spine. 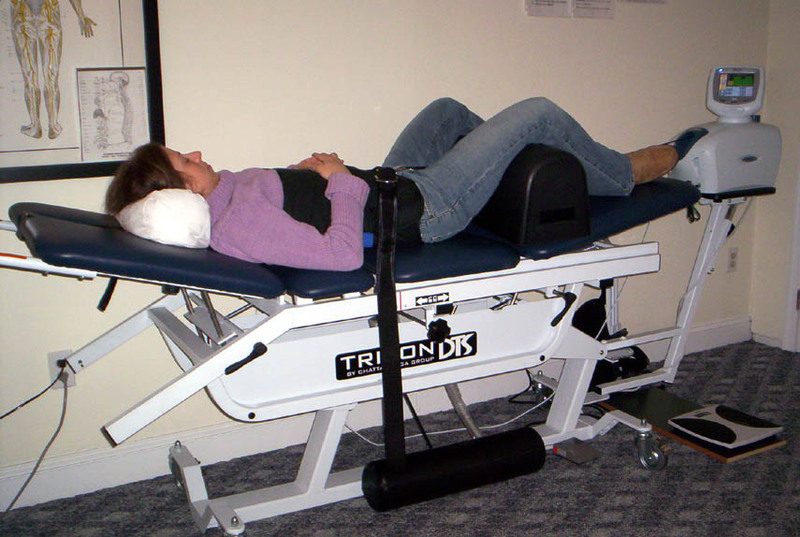 Spinal Decompression can be effective for neck or low back compression syndromes, disc bulge/herniation, sciatica, degeneration, and arthritis. Although this therapy is administered in a chiropractic office by a spinal expert, Decompression therapy is not traditional chiropractic care, but is a unique type of spinal disc treatment. Once you have completed your treatment plan of normally 8-20 visits… you’re done. Simple and effective in-office and/or home exercises will be recommended depending on your individual needs in order to create a lasting solution.